Shoe review time!! Time for a brand I have not reviewed and a shoe I've wanted to try for a while. We have the Saucony Fastwitch 6 on deck today. Fit: As others have reported, the fit is pretty great. The forefoot is not constricting and the midfoot and heel are appropriately snug. It's like a combination of a racing flat fit with a comfortable training shoe fit. I would call the forefoot "just wide enough" or "almost roomy." It's definitely not Altra wide, but it gets the job done as I don't feel any constricting feeling in the toes that will normally kill the feel of a shoe for me. The shoe also consistently runs a 1/2 size short, so make sure you order up. Even if you want a racing fit. I'm normally a 10 in most shoes and I found the 10 way too short and snug. The 10.5 fit perfectly with or without socks both width and length wise. Sometimes I'll go down a half size if I plan on wearing a shoe sockless full time. This shoe still required me to size up half a size with either condition. Even with the sizing issues, the fit is fairly secure, comfortable and has worked well at fast and slow speeds. Sole: This is not a shoe for slow recovery miles as the sole feels extremely stiff when you try to push them through that. Not a responsive stiff either. Just an extremely firm, "am I even wearing a shoe or am I running barefoot on the pavement" type of stiff. I'm exaggerating a bit as I have done recovery runs in this shoe, but it is very firm. However, when you pick up the pace, the shoe begins to show it's true colors. It's still extremely firm, but feels more responsive at faster paces. Let's just say to find the true purpose of the Fastwitch 6, you have to push it a bit. Anything fast this shoe does well. From short sprints to long tempo runs, it gets the job done. Being a supportive racing shoe, there is some mild posting in the form some dual density EVA and what Saucony calls a "Midfoot Support Bridge." In the picture above it is the grey and white stripped part of the midsole. It does provide support, but it's also very stiff (hmm... there seems to be a pattern here...). I guess I've been spoiled with technology from Brooks, Nike and others who offer either progressive or dynamic support rather than the old-school stiff "hold your foot and don't let it move" type of support. The stiffness of the support bridge also limits the flexibility of the shoe and does not provide the responsive ride that I would expect and hope for from a racing shoe with this much under foot. There is a good amount of sole under your foot, so you'd at least think you get some protection for longer miles. 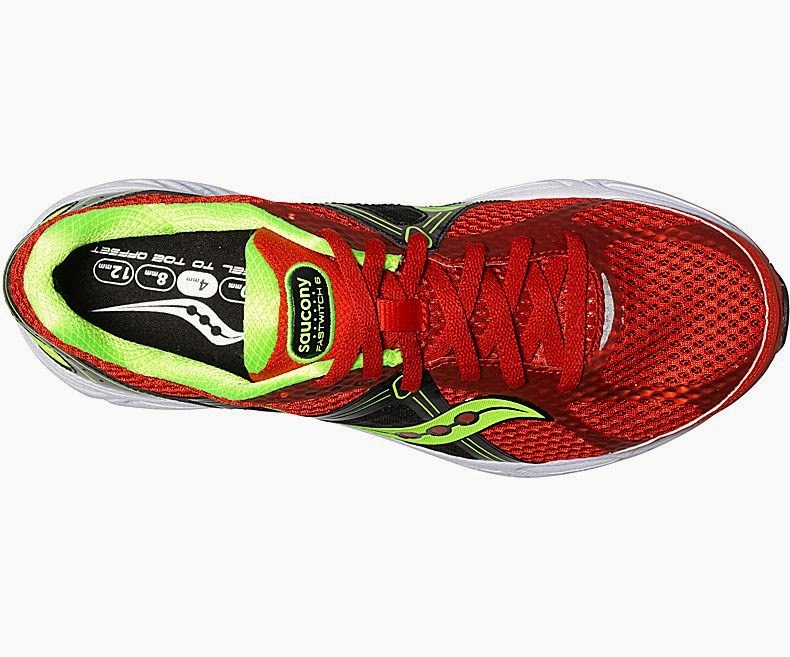 Honestly though it feels like 5 ish ounce shoes like the Asics Gel Hyperspeed 6, Brooks Puredrift, the Saucony Type A6 and others have softer cushioning and more responsiveness than the Fastwitch. Even with the lower weights. Upper: Here's the part I really like. The upper is a mesh material with flex film overlays that conform fairly well to the foot. The forefoot has a light and breathable mesh that for the most part will keep the front of your foot cool. I've worn this shoe both with socks and without and have never had any chaffing issues. To be honest though I have not worn this shoe sockless over 10 miles but up to that the shoe is comfortable. My only issue is in times of heat, the shoe is not very breathable in the heel and midfoot, which can lead to sweating. I can feel a bit of friction on the medial midfoot when this happens, but haven't had any issues. Overall I really like this upper. Here's what I don't like but doesn't seem to bother me: the heel counter. My heel is a bit sensitive to stiff heel counters and the Fastwitch 6 definitely has one. There is not a ton of padding back there, which I was very worried about at first. However, I have not had any issues with it. It seems to actually be somewhat flexible and doesn't come up super high. For those of you that are extremely sensitive to these things, be aware that the Fastwitch 6 does have one. Heel-Toe Drop/Ramp: Even though this shoe is listed as a 4mm drop shoe, it feels a bit more than that. It's not a bad thing, but die hard 4mm drop people should be aware it feels more like a 6-7mm drop shoe. 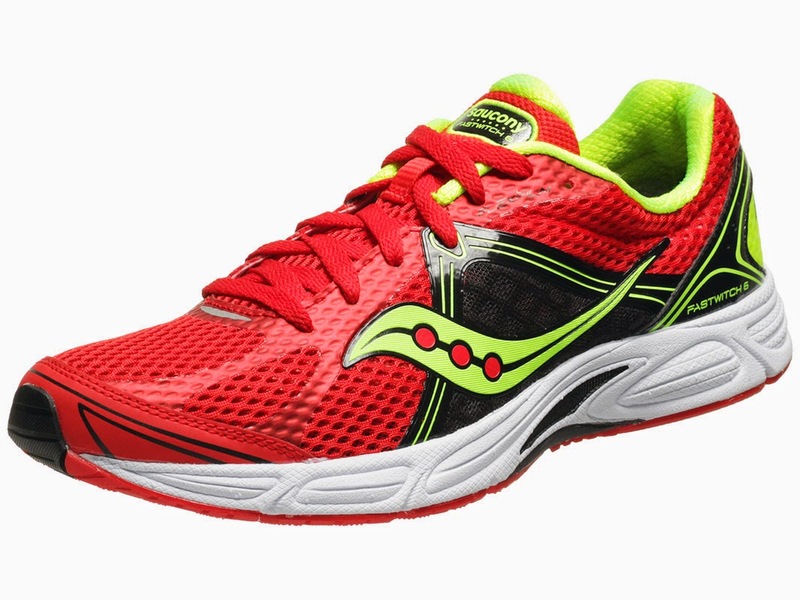 Although RW reports have shown most Saucony 4mm drop shoes are in the 7mm drop range anyway. It's 2-3mm. Not a big deal. For long mileage it's actually really awesome for when your calves start getting really tired. It's not too much but also not too little. Just right. Durability: After 100 miles of use I am indeed seeing some wear in the sole that is to be expected. I wouldn't expect to get more than 300-400 miles out of them, but overall though I am not seeing as much wear as I would expect on a racing shoe. This definitely fits more into the lightweight trainer relm of wear and tear. I am impressed that they are holding up as well as they have been due to the intensity of workouts I have put them through. I'm not seeing any major issues with the upper so far but have heard reports of the lateral midfoot busting open on people. Weight: The shoe is reported by Saucony to be 6.9 ounces, but I definitely agree with with other reports that the shoe is at least 7.5 ounces if not more. It's decent for a long distance racing flat, but it could be lighter. 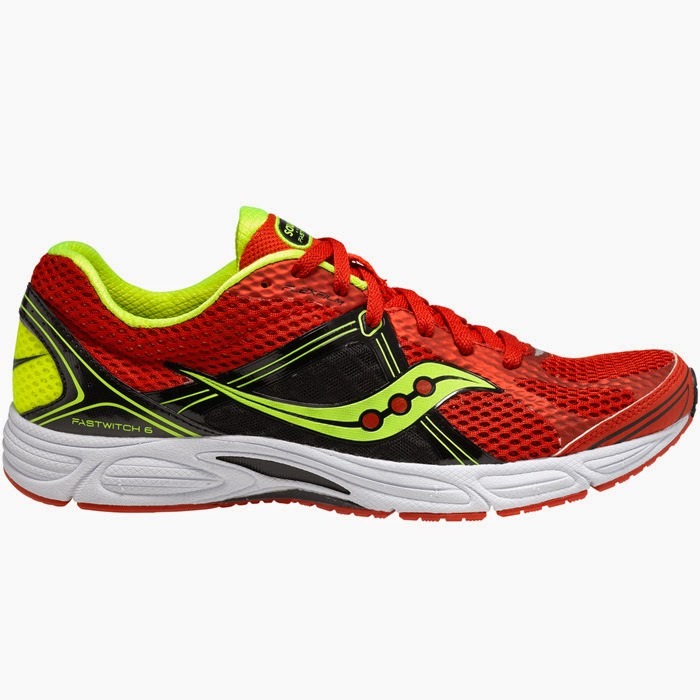 I can feel the weight of the shoe and think that when you compare the Fastwitch 6 to the Saucony Kinvara, the Kinvara feels lighter, more responsive and has a bit more functional support with the high arch (but lack of the midfoot support bridge. Which again I don't like and think really weighs down the shoe both physically and performance wise). Thoughts as a SPT (Student Physical Therapist): Really what is bothering me is the use of a stiff and non-movable support system in this shoe. When you remove the motion from one joint, it will be taken up in another joint. This is one reason why people with stiff orthotics may experience knee pain after a time. The loss of ankle joint mobility for shock absorption means that the knee will have to take those forces, resulting in higher joint forces through the knee which may bring out any weaknesses and exaggerate certain motions that can cause pain with time. Some people may never have any issues while others might. I'm not saying that stiff orthotics are always bad. Sometimes a motion needs to be restricted for whatever medical reason. For the general public though, I don't see any reason why Saucony can't get rid of the midfoot support bridge and stick with the duel density EVA. I think that would lighten the shoe up from a relatively heavy 7.5 ounces (for a racing flat) and drastically increase the flexibility and responsiveness of this shoe. This is supposed to be a racing shoe with mild support, not a motion control shoe. Get rid of that midfoot support bridge and stick with the dual density EVA. Final Thoughts: This is a great shoe if you like a really firm ride or like stiff support in a racing shoe-like package with decent room in the toe-box. I definitely think there are significant improvements that can be made in the sole to lighten the shoe up and turn it into the racing monster it deserves to be. 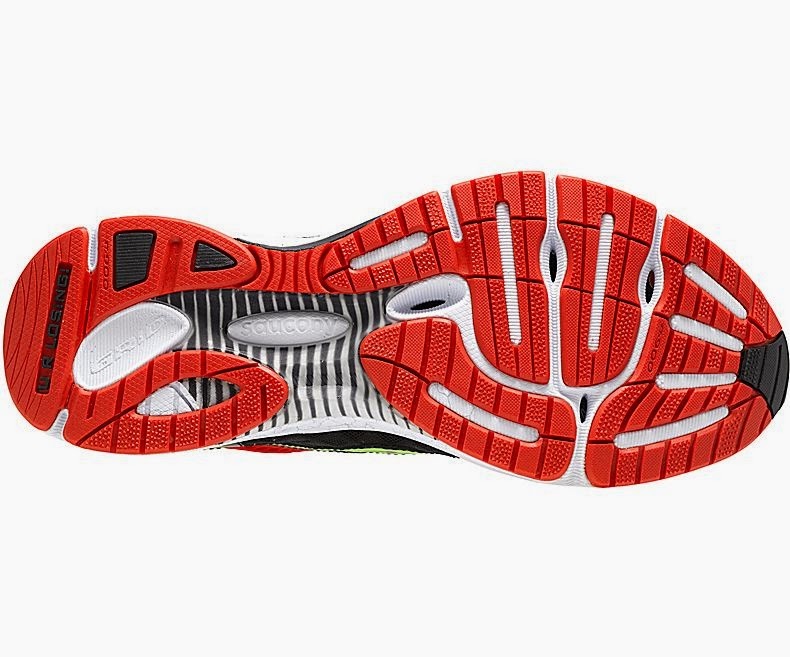 Right now though I believe the midfoot support bridge is hindering the shoe both in flexibility and responsiveness. For someone coming from a motion control shoe this might be a great racing shoe. For others it might make a great lightweight trainer. Despite my heavy apparent criticism of the shoe, I do like the Saucony Fastwitch 6 and will continue to use it until it wears out. It has been a great shoe for both long workouts and short repeats. If I ever make it onto the Saucony Hurricane team, this will definitely be a shoe in my arsenal. 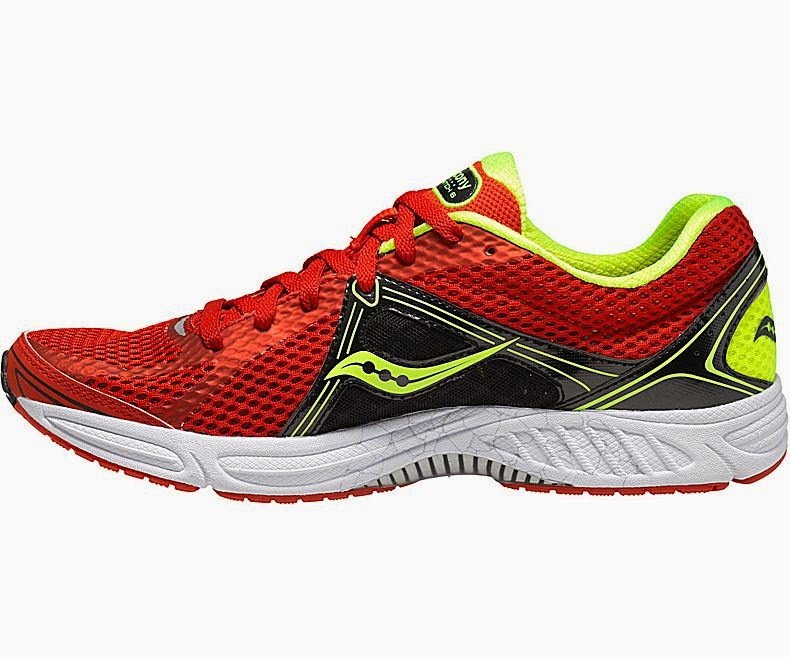 *Images obtained from the Saucony Running website. Again, go down to your local running specialty retailer to check them out!